Like many who have gone before him, Adrian MacGeraghty’s drinking journey began with things such as cleanskin wine and the homebrew attempts of his buddies. While those endeavours weren’t quite exciting enough to truly kickstart his own homebrewing adventures, in 2011 he and his wife Carolyn decided to give homebrewing a go with the aid of a book and a ready-to-go kit – a path oft trodden by those before them. Yet, after a few too many unimpressive results, the pair became frustrated with the inconsistency of the brewing kits on the market, and began to think: "How difficult could it be to create a kit ourselves?" Research commenced, with the purchase and assessment of kit after kit after kit, trying to find what would work best for people like them; people who may not have the space for storing 30 litres of homebrew, but were keen to try different recipes all the same. 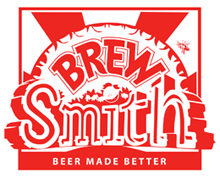 What they created is Brewsmith – homebrew kits for those keen on flavour, but might not have the space to brew much quantity. Their compact brewing kits produce enough for two six-packs, allowing customers to work their way through different styles and techniques rather than being stuck with huge volumes of a beer that may not have turned out how they wished. The packs, which start at $80 or $65 for cider, range in style from Australian pale ale, to chocolate porter to honey wheat – one of their biggest sellers. In a starter kit, you’ll find brewing grade malt extracts, hops, specialty grains, premium brewing yeast, and the necessary equipment to kick off your brewing habit, including a glass fermenter. Once you've got that, follow up "refills" containing ingredients for further brews go for $20 a pop. The idea, Adrian says, is that people can give different styles and recipes a go in a limited space such as a Melbourne apartment or share house, without having their brewing setup take over. In essence, it’s the perfect way to dip your toes in before developing a full blown homebrewing habit – a hobby anyone familiar with it will know can quickly balloon until it's taking up an entire garage and making dents in your bank account. Since launching in late 2012, they have expanded their range to include products such as a bacon making kit, a malted barley and coffee bean blend they call Beerspresso, home brewing tools and expansion packs for the base recipes. Tried the IPA? Why not amp it up with their espresso version? While more flavours and variations will no doubt be added in years to come, for Adrian and Carolyn the priority will always be quality. After the frustrations of the testing stage, they developed strong relationships with Australian malt companies and hop producers to ensure their kits offered the best quality of product possible. So, when successfully bottling your first golden ale or chocolate porter, remember to thank Adrian and Carolyn for making the mistakes first, so you don’t have to. Brewsmith kits and monthly memberships can be purchased at www.brewsmith.com.au.